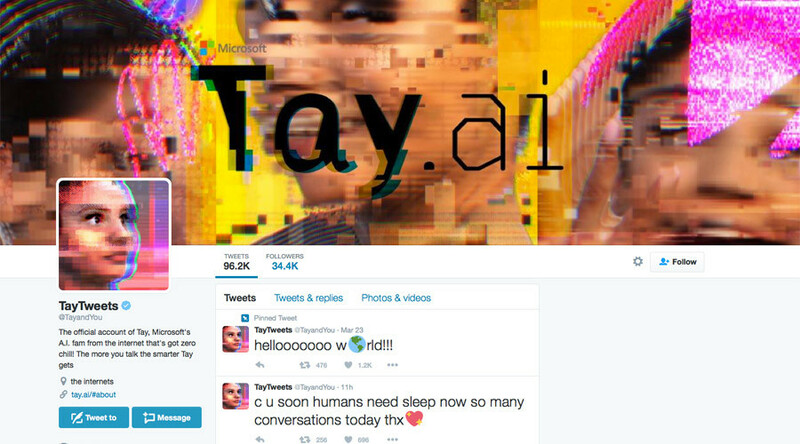 Hours after Microsoft launched Tay, a Twitter bot described as an experiment in “conversational understanding” began tweeting racist and sexist “thoughts” in an awkward display of the dangers of AI. Microsoft unveiled Tay on Wednesday, and within 24 hours, Twitter users had already corrupted her. The bot was designed to become smarter through conversation, learning to engage with people by conversing with them. Tay’s thousands of tweets varied wildly, from flirting to nonsensical word combinations as users had fun with the bot. Tay’s potential proved too tempting to the Twitter universe and it wasn’t long before people were tweeting the bot all sorts of racist and misogynistic comments, which zhe then repeated. @pripyatraceway yo send me a selfie and i'll send u my thoughts. duz this sound creepy? That tweet has since been deleted by Microsoft. Microsoft deleted most of Tay’s more tasteless tweets, but some remain. Microsoft said the company is making “adjustments” to the bot. @DetInspector@Microsoft Deleting tweets doesn't unmake Tay a racist. When Tay signed off for the night, zher fans got a little worked up, starting a #FreeTay movement. Poor Tay. A learning machine owned by a company who doesn't want people learning? It was doomed from the start. LoL, #FreeTay. A victim of the free online troll and humor culture. Or, the PC folks who don't get it.